Last major update issued on June 10, 2005 at 04:20 UTC. The geomagnetic field was inactive to quiet on June 9. Solar wind speed ranged between 348 and 427 km/sec. Solar flux measured at 20h UTC on 2.8 GHz was 116.1. The planetary A index was 5 (STAR Ap - based on the mean of three hour interval ap indices: 4.9). Three hour interval K indices: 11022221 (planetary), 10003112 (Boulder). At midnight there were 6 spotted regions on the visible solar disk. The solar flare activity level was low. A total of 2 C class events was recorded during the day. Region 10772 decayed slowly and quietly. Region 10773 decayed slowly and quietly, the leader spot could disappear today. Region 10775 developed further and has two magnetic delta structures, one near the southern edge of the main penumbra and another one in the trailing penumbra (which could merge with the main penumbra if growth continues) An M class flare is possible. Flare: C1.5 long duration event peaking at 13:34 UTC. Region 10776 developed slowly. Complexity increased as positive polarity flux emerged near the southern edge of the large leading penumbra. A major flare is possible. 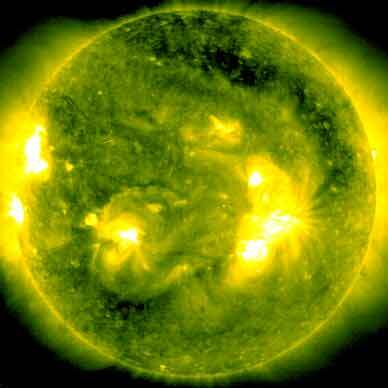 Flare: C1.0 at 16:31 UTC. [S556] This region emerged on June 9 just south of region 10775 and currently has its spots aligned along a north-south axis instead of the usual east-west orientation. Location at midnight: N05E05. [S557] A new region emerged near the northeast limb on June 9. Location at midnight: N05E67. June 7 and 9: No obvious fully or partly Earth directed CMEs were observed in LASCO images. June 8: At least a partial halo CME was observed in LASCO C3 images during the late afternoon and early evening. The ejected material was first observed over the southwest limb and was likely related to a filament eruption to the north of region 10772. No obvious coronal holes are currently near Earth facing positions. Processed SOHO/EIT 284 image at 01:06 UTC on June 6. The darkest areas on the solar disk are likely coronal holes. The geomagnetic field is expected to be quiet to unsettled on June 10. The CME observed on June 8 could reach Earth late on June 11 or early on June 12 and cause unsettled to active conditions. Quiet to unsettled is likely on June 13. 2) Material from a CME is likely to impact Earth within 96 hours. Long distance low and medium frequency (below 2 MHz) propagation along east-west paths over high and upper middle latitudes is very poor. Propagation along long distance north-south paths is fair to poor. Trans Atlantic propagation conditions are normally monitored every night on 1470 kHz. Dominant stations tonight: Radio Cristal del Uruguay and Radio Rafaela (Argentina). On 1510 kHz Radio Belgrano was dominant while AM Restauración on 1630 kHz had a much better signal than what I usually observe. 2) Unofficial, accumulated value based on the Boulder (NOAA/SEC) sunspot number. 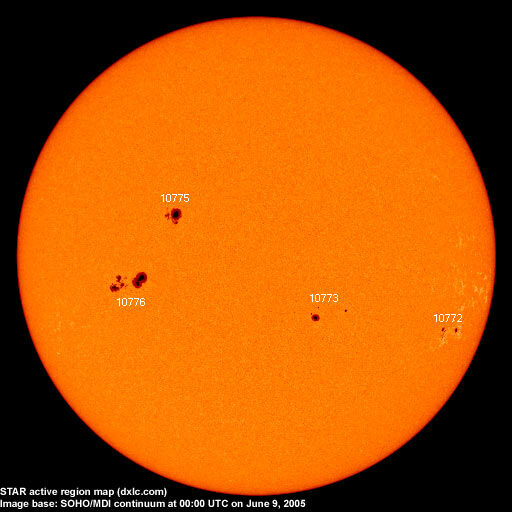 The official international sunspot number is typically 30-50% less.